DERWINSKI, Edward Joseph, a Representative from Illinois; born in Chicago, Ill., September 15, 1926; graduated from Mount Carmel High School in 1944; served in the United States Army as an infantryman with service in the Pacific Theater and with the Japanese Occupation Forces in 1945 and 1946; B.S., Loyola University, Chicago, Ill., 1951; president of the West Pullman Savings & Loan Association, 1950-1975; served one term in the Illinois house of representatives in 1957 and 1958; Secretary of the Department of Veterans Affairs, 1989-1992; delegate to the United Nations General Assembly, 1971- 1972; elected as a Republican to the Eighty-sixth and to the eleven succeeding Congresses (January 3, 1959-January 3, 1983); unsuccessful candidate for renomination in 1982 to the Ninety-eighth Congress; chairman, U.S. delegation to Interparliamentary Union, 1970-1972, 1978-1980; counselor, Department of State, March 18, 1983, to March 23, 1987; under secretary of state for Security Assistance, Science and Technology, March 23, 1987, to January 21, 1989; died on January 15, 2012, in Oak Brook, Ill.
Ralph Nader Congress Project. 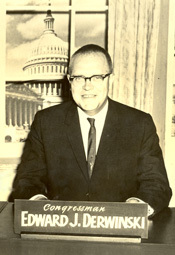 Citizens Look at Congress: Edward J. Derwinski, Republican Representative from Illinois. Washington, D. C.: Grossman Publishers, 1972.